Those powerful words from St. Thérèse of Lisieux served as an inspiration for me and 70 other youths from the archdiocese who participated in Homeland Mission 2008. 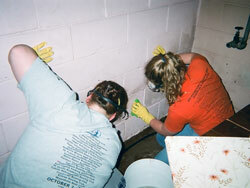 The Homeland Mission Project is an archdiocesan youth ministry program that began in 2005. Experiencing the real world involved a week of tasks that ranged from helping flood victims in central Indiana to distributing lunches to homeless people in Indianapolis. Those efforts tested our patience and previous perceptions of what we believed the real world to be. The first task for my group focused on Gleaners Food Bank, where we helped package the food that eventually goes to people in need. Near lunchtime, we moved to the AT&T building in downtown Indianapolis, where Glenda Hoffman and Cece Rodgers started the Red Wagon program. This initiative involves taking wagons filled with sack lunches and rolling them around the downtown area, where we handed lunches to the homeless. This experience was humbling in that it was somewhat awkward roaming the streets of my hometown with a wagon of food and water—and then realizing, as the people gathered for the food, that this might be the only meal they got all day. It was even more humbling to see how these people were so appreciative of the food. The second day began with a long drive to Edinburgh, where an elderly woman named Betty patiently awaited our arrival. When we arrived, we saw the tremendous damage that four feet of water from recent floods had done to her home. She was not able to bleach her own floors so we did the job for her with love. Her appreciation and gratitude toward us were overwhelming. We all shared tears of thanksgiving during a group hug before we left. The third day, my personal favorite, involved a visit to St. Mary’s Child Center in Indianapolis, where children come to learn, play and have nutritious meals. While at St. Mary’s, we played with the children and got to know them and their different personalities. Most of the children were shy at first but, eventually, they became extremely talkative and easy to get to know. At the end of the day, it was very hard to leave because each child had had a profound effect on each one of our hearts. On the fourth day, our group went to Our Lady of Lourdes Parish in Indianapolis, where our group leader, Emily Perkins, is the youth minister. Vacation Bible School was in session so we talked to the children about community service and what we had been able to do to support our community. During the week, our large group of 70 volunteers slept and ate at St. Bernadette Parish in Indianapolis. As you can imagine, our headquarters at St. Bernadette’s became pretty disorganized near the end of the week. Day Five for my small group was spent cleaning St. Bernadette’s hallways and rooms so that we left things in good condition. The best part of this day was that we received “first shower” privileges before the other groups came back from their daily work. There is a saying that hard work always pays off. That saying came to life during our week of volunteer work. Some teenagers take what they have for granted, but after this eye-opening experience of the true “real world,” I don’t think we will ever look at what we have in the same way. I also want to thank Father Jonathan Meyer, who heads up this youth mission trip. He is the best! I am also thankful for the wisdom, insight and help from Archbishop Daniel M. Buechlein, who saw the need within our own archdiocese for a Homeland Mission.